Meitheal. The Archaeology of Lives, Labours and Beliefs at Raystown, Co. Meath. The archaeological site at Raystown was lost for 1,000 years, until it was rediscovered by geophysical survey as part of archaeological investigations along the route of the M2 Finglas–Ashbourne road project. Archaeological excavations carried out over a year revealed that Raystown began as a cemetery in the fifth century AD and evolved over the next 200 years into a large farming settlement surrounding the cemetery. In the eighth century the site developed further into a milling centre and continued in use for another 400 years. 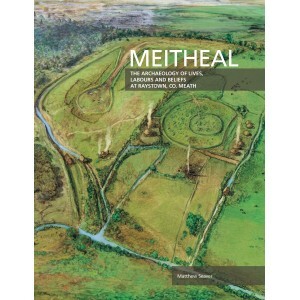 Most of the known early medieval mill sites in Ireland featured a single mill or sometimes two. At Raystown there were eight mills. This is unprecedented in the Irish archaeological record. The book also describes the large number of artefacts recovered, included dress accessories, domestic equipment, and the tools and by-products of craftworking. Some finds testify to personal moments: a ringed pin from a cloak accidentally dropped into the swirling waters under a mill, or a glass bead carefully placed around the neck of a child being laid to rest. Other finds included imported luxury goods indicating that Raystown was connected to a trade network with Anglo-Saxon England and the European mainland in the fifth to mid sixth centuries AD. Author Matthew Seaver is a graduate of the University of Bradford and University College Dublin. He has conducted extensive excavations, and research, particularly in County Meath, on the archaeological landscape of the early to later medieval period. His specialist research focuses on early medieval cemetery-settlements. He is a native of Kilkenny and lives in north Dublin. Publisher Transport Infrastucture Ireland, Dublin.